National Poetry Day 2017 - sample & offers!!! This year's theme is freedom, which isn't quite the same as free poetry, but we are offering this 'free' video sample of some of our publications. The video (created for our submissions window last year) features poetry snippets from Jacqui Rowe's Ransom Notes, David O' Hanlon's art brut, Claire Walker's The Girl Who Grew Into a Crocodile, Kathy Gee's Book of Bones, Alex Reed's A Career in Accompaniment and David Calcutt's The Old Man in the House of Bone (with illustrations by Peter Tinkler), as well as prose from Carrie Etter's flash fiction pamphlet Hometown. Those who have been following us for a while will realise that these are all titles from before last year's National Poetry Day. This is because our list has more or less doubled over the past 12 months and V. Press editor Sarah Leavesley has been busy editing new titles. Our full range of pamphlets and collections can be found in our online Bookshop, along with links to sample poems/flash fiction. HAPPY NATIONAL POETRY DAY 2017!!! Review news & Free Verse 2017!!! We're very very delighted to share the latest reviews - of Romalyn Ante's poetry pamphlet Rice & Rain and Jude Higgins' flash fiction pamphlet The Chemist's House. "This is a powerful debut that demonstrates a control of language and emotion typical of poets at more advanced stages in their careers. In her editorial blurb, Jane Commane says Ante’s poems are ‘a real feast for the senses.’ Indeed, by focusing on sensory details – from listening to the ‘rattle’ of ‘monsoon raindrops’ and the ‘tarri-tik’ of the ‘hornbill lizard’, to smelling a mother’s ‘tamarind-scented fingers’ – Ante’s work richly exploits sensory awareness of her homeland, The Philippines." Elisabeth Sennitt Clough, Sphinx, full review here. 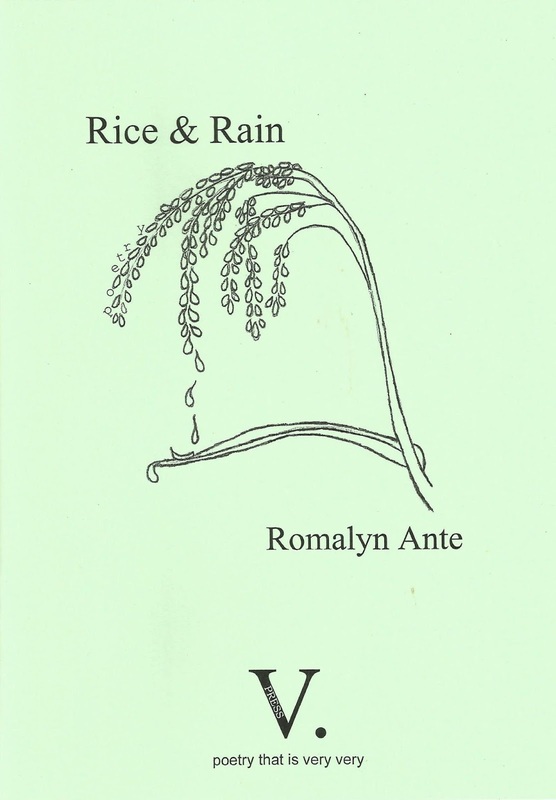 BUY Rice & Rain now using the paypal link below. "Jude Higgins has created a particular rendition of the universal experience of childhood and adolescence, a microcosm explored with a light but thorough touch, and in particular through taste and smell." Cherry Potts, Sabotage Reviews, full review here. 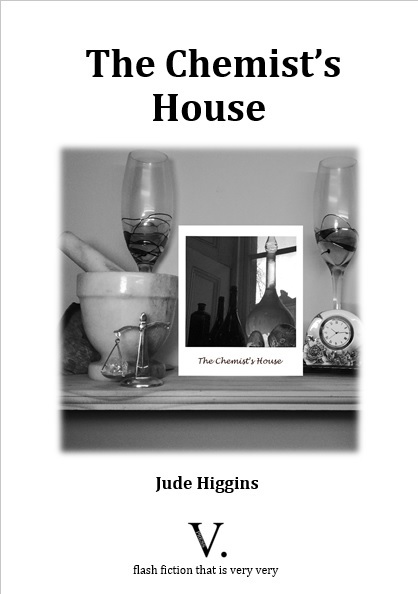 BUY a copy of The Chemist's House now, using the paypal link below. 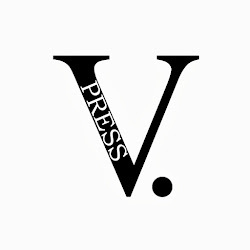 This year’s Poetry Book Fair takes place on Saturday, September 30 at Conway Hall in London and I will again be taking V. Press. 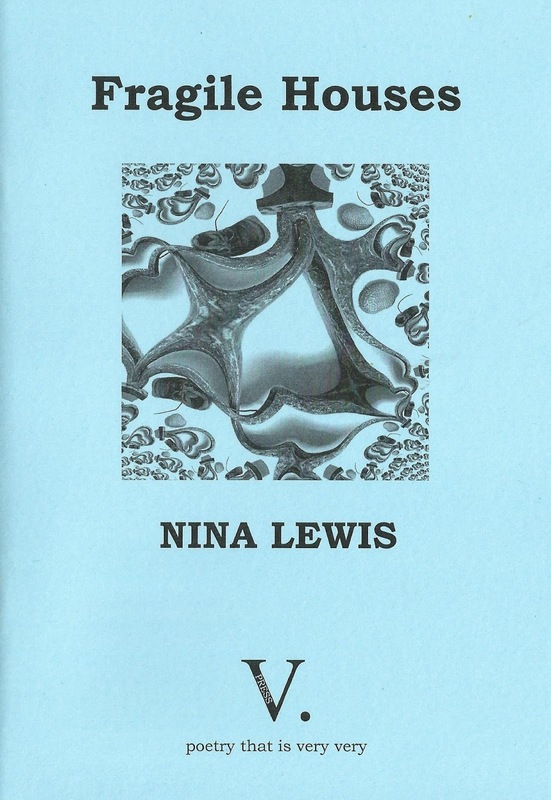 As well as a stand, this year we also have a V. Press reading by Stephen Daniels and Nina Lewis at 3pm at the GARDEN CAFE in RED LION SQUARE. “Unbroken : V. Press poets celebrate connection/disconnection. 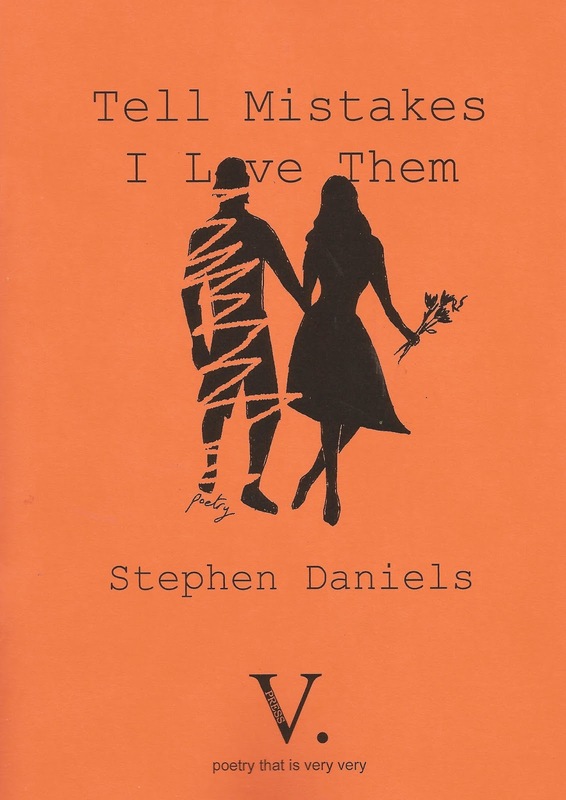 Stephen Daniels reads from ‘Tell Mistakes I Love Them’, exposing social nerves and poking at the wounds with very vulnerable and very poignant poems. The fair itself is free to enter and is open to the public from 11am - 6pm, with an Evening Do from 7pm onwards, at Conway Hall (25 Red Lion Square, London WC1R 4RL). The Nagasaki Elder - review news!!! 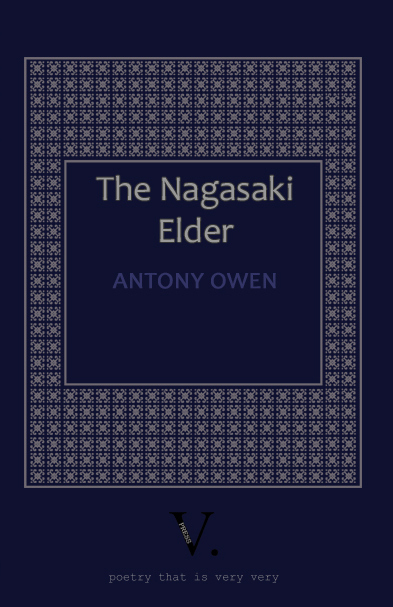 We're very very delighted to share not just one but two reviews of Antony Owen's very very hard-hitting yet very tender The Nagasaki Elder. The collection was only published last week and already has reviews in The Morning Star and the Hong Kong Review of Books. "The poetry in this book is stark and vivid. Owen does not mess about, casting solid images, the burnt shadows of the victims, and more pertinently the survivors who bear witness to these awful events. Antony applies presence and absence, the point of impact contrasted with the eerie stillness that follows flattened earth and muted lives. I particularly enjoyed the Senryu poems, that apply a haiku-like form to leave powerful and indelible images that haunt you long after the poem has been read and absorbed." Buy The Nagasaki Elder now, using the paypal link below. The Nagasaki Elder will be launched on Thursday, September 7 at Inspire Bar (Christchurch Spire, New Union St, Coventry CV1 2PS) from 7.15pm to 9.15pm. More about the collection and a sample poem may be enjoyed here. 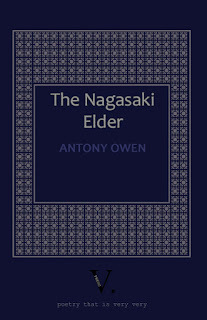 V. Press is very very delighted to launch The Nagasaki Elder, a full poetry collection by Antony Owen. The Nagasaki Elder is very very hard-hitting yet very tender. Launch details and a sample poem from the collection may be enjoyed below. so he could be buried at last in sunlight. and starlings are beginning to land by my feet. I had tried to make another child but gave birth to pink curd. for the willow which strokes my son. I have tried to tell my son that he was ten yards from living.